In small saucepan melt butter. Stir in flour and mustard. Add milk. Cook over medium heat, stirring constantly, until boiling and thickened. Remove from heat. Add cheese, a little at a time, stirring until melted after each addition. Slowly add cheese mixture to egg yolks, stirring constantly. Cool slightly. Stir in rice and onion. In small mixing bowl beat egg whites on high speed of electric mixer until stiff peaks form (tips stand straight). Gently fold egg white into cheese mixture. 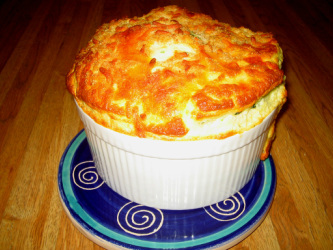 Spoon into 4 ungreased 1 1/2-cup soufflé dishes, ramekins or custard cups. Bake at 350°F about 25 minutes or until a knife inserted near center comes out clean. Serve immediately.